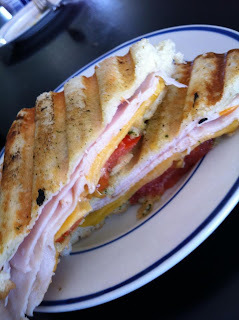 I made this panini a few weeks ago, and am not exaggerating when I say I have eaten at least 10 of these sandwiches since. I LOVE them! Best panini ever. In the picture above I used cheddar cheese because I had just finished off the jack cheese. Cheddar works great, but Monterey Jack cheese is better! Try it out and tell me what you think! It kind of tastes like the Turkey Spinach Artichoke panini from Zupas. I'm totally making this soon. I got Jeremy a panini maker for Father's Day this year and we have yet to break it out! Thanks for posting this! I got a panini press for Christmas. I'm totally new to the whole panini thing. Thanks for keeping yours simple and explaining it all! I made them tonight for dinner. Yummy! I used sourdough bread for mine and my husband's, but just the usual whole wheat for my kids (ages 2 and 5) because I didn't think they'd go for sourdough. I used monterey jack cheese on half and provolone on the other half, just so we could try two kinds of cheese. Both good, both favorite! ;) And the artichokes are a good addition....but the kids didn't like them (no real surprise there.) I forgot to buy a tomato, so we missed out on that part...will be sure to get one next time.